By this point in our movie-watching careers, we’ve probably spent more time watching Vietnam movies than some active-duty soldiers actually spent in Vietnam. But this one is a little different as it’s not strictly a jungle slog, it’s more a story about the MP’s and their police work, on the city streets of Saigon. So in that sense it’s a different take on the subject matter. 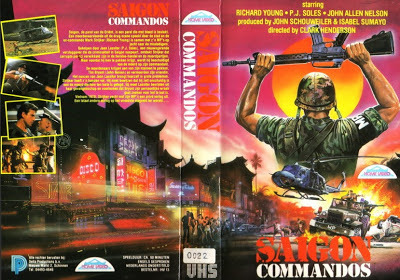 However, Saigon Commandos still comes out as a standard-issue Corman ‘Nam movie that easily could have been directed by Cirio Santiago. Even though Richard Young was in the far-superior Final Mission (1984), and of course the movie at hand today, we still don’t know what he looks like. Such are his undistinguished features and lack of personality. But he does team up with his great Final Mission co-star Jack S. Daniels. Also onboard is mainstay Joe Mari Avellana (who co-wrote Final Mission), Willie Williams (again of Final Mission, as well as Savage Justice), as well as Cris Aguilar and Louie Del Castillo, who both have been in plenty of movies of this type. On the other hand, it’s nice to see P.J. Soles, who doesn’t often appear in this style of film, but we felt wasn’t used to her full potential here, playing the cliched reporter role. Unfortunately, we’re a long way from “Always On My Mind”. 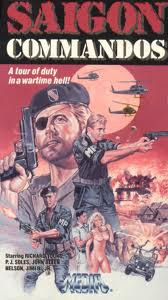 As far as this being yet another movie where the hero is named “Stryker”, we thought that would be a recipe for success. Sadly, it was a disappointment. But we had an idea for a movie called “SuperStryker” (or maybe “Striker” with an I, we haven’t decided yet), where all the action stars who have ever portrayed a character named “Stryker” get together and raise hell in the jungle. We imagine it would star Wings Hauser, Richard Norton, Richard Young, and maybe even Frank Zagarino. (Sure, no one actually called him “Striker” in “Striker”, but hey, he's clearly Striker in all of our hearts. Plus we’ll get that little kid from Hostage who uttered the immortal line “Mommy, where’s Striker?”). Don’t you wish your name was Stryker? As far as the political scenes, people have homemade banners that say “Our country is a sewer”. This doesn’t exactly help people who read the sign know what they WANT, but they do seem to love statements of fact concerning their destitute situation. The plotline closely follows the “El Presidente” model we’ve discussed many times. But instead of a South America-set actioner, this might be the first Asian “El Presidente” we’ve yet come across. But there is a band in the movie called the “Eurasia Band” who do covers of “House of the Rising Sun” and “Midnight Special”, so that’s a bridge between cultures. Released by the great Media label, sadly, despite all it has going for it, Saigon Commandos was a letdown. Yeah, this film was a little slow moving for me, not bad, but Clark Henderson's other films(Warlords From Hell, Circle Of Fear, and Primary Target) were better made and more entertaining. We haven't seen the ones you mentioned yet, but we are glad to know that these are better. Thanks for the suggestions. Thanks for the link, and that's a cool review (one that I'm certainly not going to argue with). You're welcome! We haven't seen them either, and there's always so many more. I've got the Australian VHS of this and agree, it could have been better. The sound on my edition was appalling, too. That is unfortunate about the sound! We are in agreement...this movie was disappointing.